You represent the symbol of the struggle that is giving hope to this world, showing that resistance is a valid strategy. We cannot surrender everything to fear. The struggle is our alternative and that is why, we’re all in this together. Many women know their history, and many women know how to confront the same situation. You are the strength. You won’t ever go on your knees, and we will all resist together. This past year, Thousand Currents was thrilled to support World March of Women, a global feminist movement connecting grassroots groups and organizations working to eliminate the root causes of poverty and violence against women. From October 23rd to 25th, activists from Brazil, Canada, Chile, Cuba, Guatemala, Mexico, Panama, Peru, the US, and Venezuela met in Cajamarca, Peru to participate in the Fourth Regional Gathering, from which the powerful quote above was spoken. 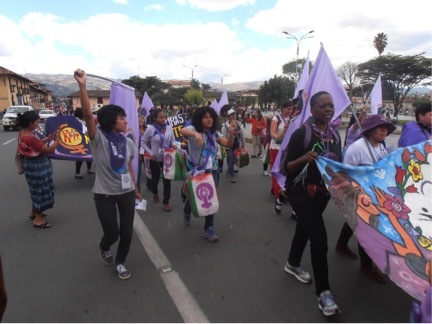 World March of Women, Fourth Regional Gathering in Cajamarca, Peru. Country by country, World March of Women-Americas analyzed the threats to women’s rights work, as well as the range of models that women were building to overcome them. This three-day discussion enabled a mapping of common struggles across nations in the Americas, in particular, issues dealing with the defense of women’s bodies, land and territory. Organizing the Fourth Gathering in Cajamarca was strategic and timely to support local human rights and environmental activists. 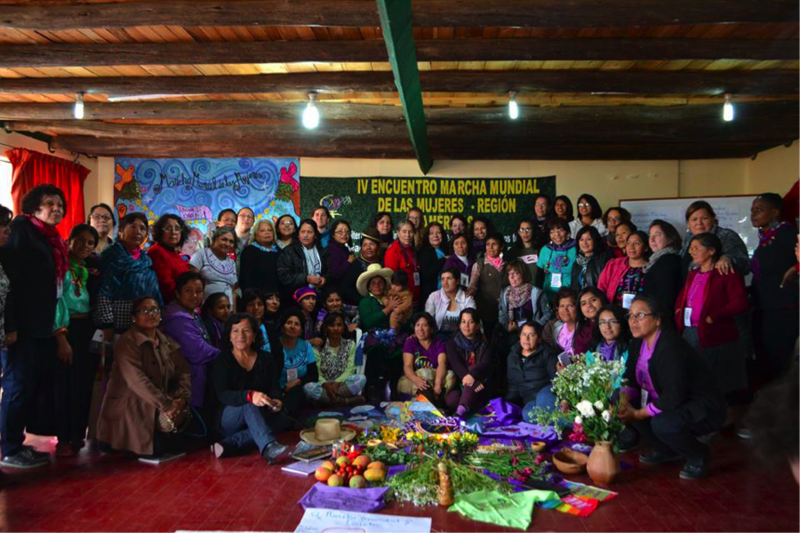 Time was deliberately given to learn and reflect on what is happening in Cajamarca regarding the defense of natural resources by women human rights defenders and the existing political landscape of Peru. Mapping each country’s context in terms of challenges and opportunities builds each participant’s analysis and helps find common struggles where joint actions can be made for attention and solidarity. To link women’s rights with environmental justice within the COP21 process and beyond. Our natural resources and land are the reason to be in this world. We bring you our energies and we join them together with yours. World March of Women activists stage a demonstration for women’s rights.